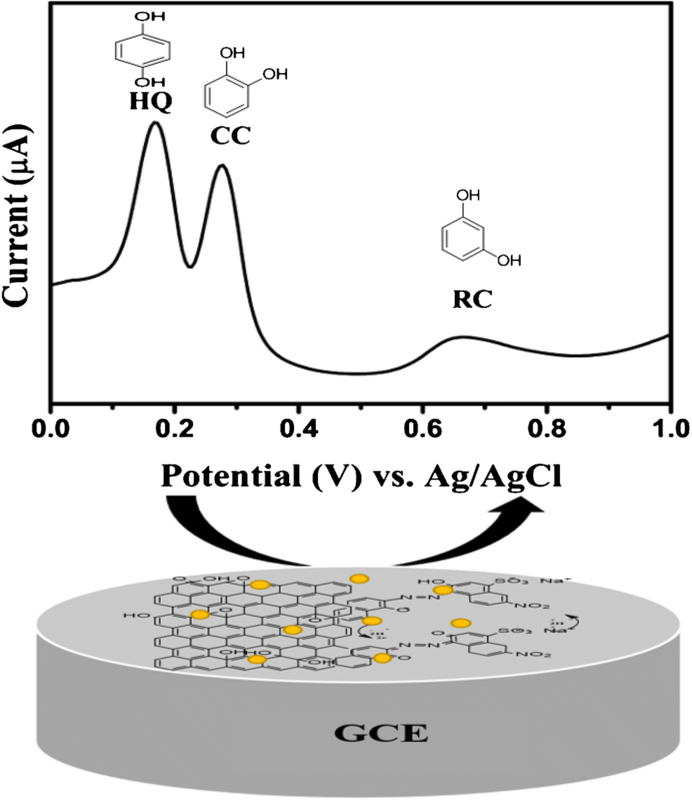 A nanocomposite consisting of electrochemically reduced graphene oxide, poly(Eriochrome black T) and gold nanoparticles (ERGO-pEBT/AuNPs) was prepared for the simultaneous detection of resorcinol (RC), catechol (CC), and hydroquinone (HQ). The electrochemical oxidation of HQ, CC, and RC was analysed by using cyclic voltammetry and differential pulse voltammetry. Three well-separated potentials were found at 166, 277, and 660 mV (vs. Ag/AgCl) for HQ, CC, and RC, respectively The linear ranges were 0.52–31.4, 1.44–31.2, and 3.8–72.2 μM for HQ, CC, and RC, respectively. The limits of detections (LODs) for both individual and simultaneous detections are negligibly different are (15, 8, and 39 nM, respectively). Voltammetric determination of hydroquinone, catechol, and resorcinol at ERGO-pEBT/AuNPs resulted in high peak currents and outstanding oxidation potential separation of the analytes. 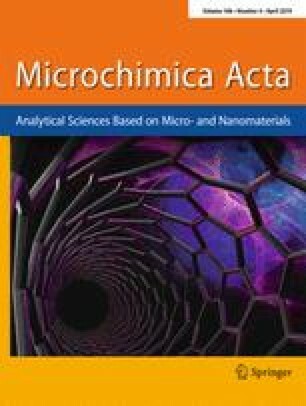 The online version of this article ( https://doi.org/10.1007/s00604-019-3376-y) contains supplementary material, which is available to authorized users. This research has been funded by Universiti Putra Malaysia Research Grant (GP IPS/2016/9512900). Thanks also to the Organization for Women in Science for the Developing World (OWSD) and Sida (Swedish International Development Cooperation Agency) for the scholarship to Nusiba Mohammed Modawe Alshik.